Others are stranded, unable to work on expired visas. Thousands of Kharafi workers are owed months of back pay. 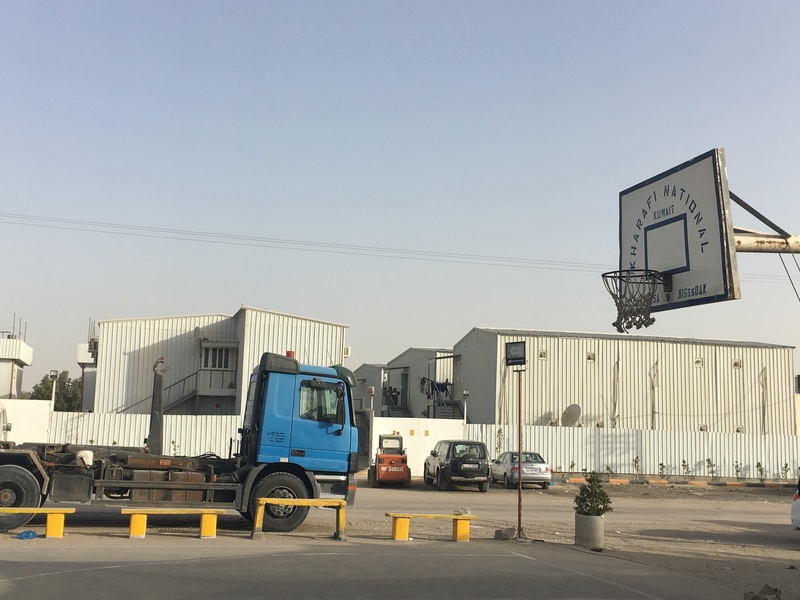 In the camp in West Shuhaiba industrial area, a desolate Kharafi National branded basketball court is the muster point for workers in the adjacent camp. This camp houses mainly Thai and Filipino workers who once considered the company a choice employer. In 2013 the management of the family business changed hands, resulting in continuing breakdown of internal systems. Workers say that after the original owner passed away, the heirs took over, and it was then that the company began to fall apart, due to alleged mismanagement. Kharafi had some of the best contracts in the country, from public sector companies to government agencies. The infrastructure and sub-contracting firm has ongoing contracts, mostly with oil companies. Sources say even though contract fees were paid, salaries started to be delayed. At first for a month or two, until eventually they stopped being paid at all. One of Kharafi’s contracts was the Jaber Al-Ahmad Al-Sabah International Stadium which hosted the recent Gulf Cup Finals. According to the company’s website, its contract value is USD190,000,000, around KD120 million. A barrier collapsed at the stadium injuring 40 spectators during the finals, and the company drew the ire of the citizens for poor quality of work and for not meeting the safety requirements and “embarrassing Kuwait”. Many Kharafi employees continued to work without pay, and some of the workers we spoke to still do so. Others resigned after months of nonpayment, while some others were forced to stop working when the company failed to renew their work visas. They all await backpay and end of service benefits. 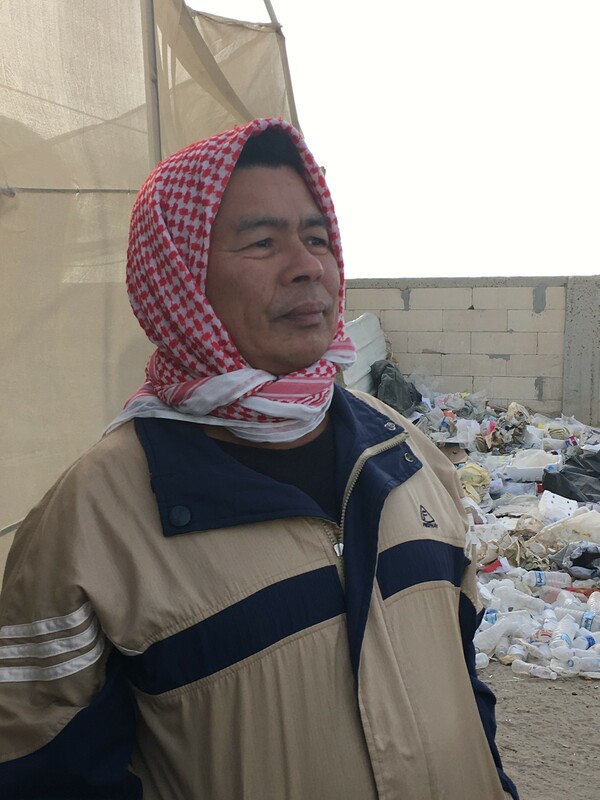 The workers Migrant-Rights.org spoke to were primarily contracted to Kuwait National Petroleum Corporation (KNPC) and Kuwait Oil Company (KOC). The 32 workers from Thailand have not been paid for 6 to 10 months, and the majority do not have a valid visa. Workers are criminalized for this forced irregularity, through no fault of their own. Some with better resources than others have paid for their own visa renewal and penalties. 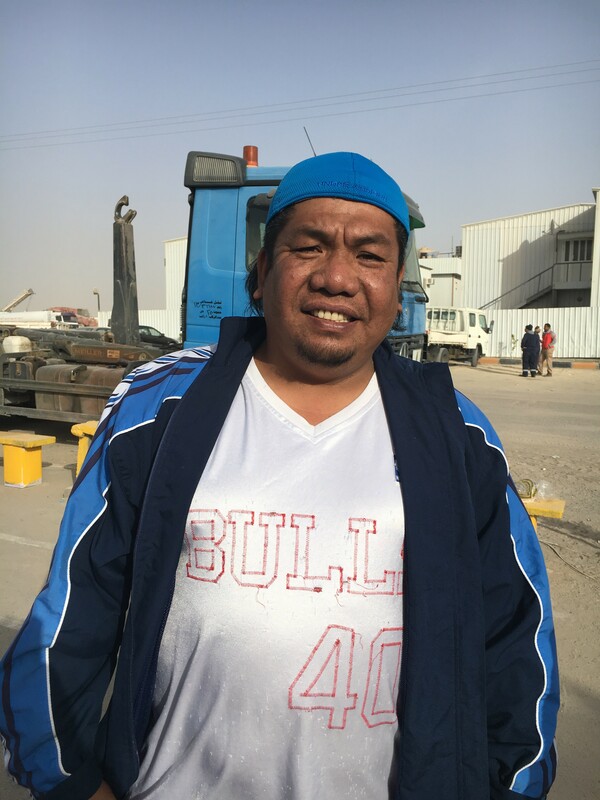 Dominedor of Philippines has been with the company for 11 years, drawing a monthly salary of KD150. A heavy vehicle operator deployed to a KOC project, he hasn’t been paid for 10 months. He shelled out KD264 (approx USD800) from his pocket to renew his visa. بعض العمال التايلانديين والفلبينيين في المخيم. لا يزال كورونادو يعمل لصالح عميل الخرافي شركة البترول الكويتية الوطنية، الذين يدفعون رواتب العمال مباشرةً. لم يتم الدفع لدومينيدور، مشغل آلات ثقيلة، لمدة 10 أشهر. Andrew Sayasaya doesn’t hold much hope. A forklift operator, he resigned last June because he had not received his salary for 8 months. He has not received back pay or benefits and his visa is set to expire on Feb 7. An estimated 7,000 employees of Kharafi international have been stranded. Over 3,000 of the workers are from India, and according to reports, are awaiting KD 8 million (USD 26,631,120) in back pay. The Kuwait Society for Human Rights (KSHR) has been following issues of the 7386 affected workers and released a statement calling on the Minister of State for Cabinet Affairs, and Minister of Social Affairs and Labor and Minister of State for Economic Affairs, to exempt workers from fines accrued as a result of violating the Residency Law. It hoped in its statement that "the government will take strict measures against companies that violate local and international laws". Through their "Support" project, KSHR is providing free legal assistance for workers to represent and defend their cases in labour courts, and advised workers to unite to have a stronger case in court. Some governments have begun to repatriate stranded workers. In December, the Nepalese government initiated the repatriation of the estimated 300 Nepali Kharafi employees. Other workers had already left, their families bearing the cost of their tickets and expired visa fines. In the meantime, they’ve all forfeited their salaries, hoping the embassy can reach a settlement in their absence. Kharaifi case is neither unique nor unavoidable. High dependency on expatriate labour, the Kafala system and corruption in recruitment and subcontracting across the GCC is fertile ground for such fiascos. The Saudi Oger collapse, which left thousands of workers stranded and without pay while company officials took little accountability, had similar underlying causes. Large organizations such as KNPC and KOC depend on manpower agencies and sub-contractors, but there’s little accountability when these contracting relationships fall apart. In the year plus since workers have stopped receiving salaries, the company has not released a statement. The Kuwaiti government – whose largest contractor is Kharafi – has acknowledged the situation only indirectly, stating that it has announced an emergency task force for workers in the private sector. This week, Kuwait announced an amnesty for undocumented workers, allowing them to leave the country without paying penalties or regularise their status between January 29 and February 22. Saudi announced a similar amnesty in 2017 following the Saudi Oger and Bin Laden Group collapse, both governments likely using the amnesty as a strategy to manage but not confront the forced irregularity of a large workforce created by poor policies.